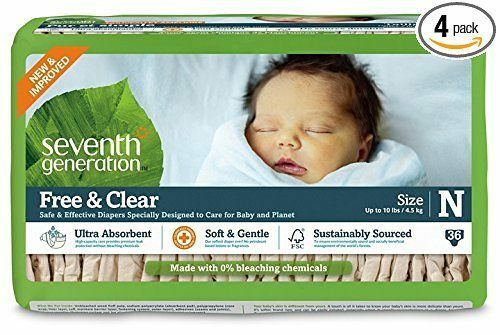 Seventh Generation Free and Clear Diapers Just $2.99 per Jumbo Pack! You are here: Home / Great Deals / Amazon Deals / Seventh Generation Free and Clear Diapers Just $2.99 per Jumbo Pack! Are you expecting a new baby or have an upcoming baby shower? Right now, you can get Seventh Generation Free and Clear, Unbleached Baby Diapers, Newborn, 144 Count for just $13.19 plus FREE shipping when you enter promo code SEVENG50D at checkout and select Subscribe and Save! That’s equal to $2.99 per jumbo pack! In addition, Amazon Prime members can save 50% on select Seventh Generation Diapers, Wipes & Household items. Just use promo code SEVENG50D on diapers, SEVENG50W on wipes, and SEVENG50HH on household products. Go HERE to see all included products. Clip coupons on select Seventh Generation products and save an additional 20% on diapers when you select Subscribe & Save on top of these promo codes!